When my mom received her breast cancer diagnosis in 2013, when my son was almost 8 months old, I didn't think at all about what might mean for me. Instead, I thought about what she might miss, about if she would see my son grow, if she would get to enjoy her retirement years. When my dad's sister received a breast cancer diagnosis way back in the early 1990's, when I was still very much a kid, I worried that my cousins wouldn't have a mom. Thankfully, both of these women are cancer free years after their initial treatment, and they have been able to continue on and make new memories with their families. At each doctor's visit, I carefully fill out a family history. I have to mention that my grandfather and mother have diabetes. I write down my own surgical history. I check the boxes next to "history of breast cancer," and that's it. I move on. 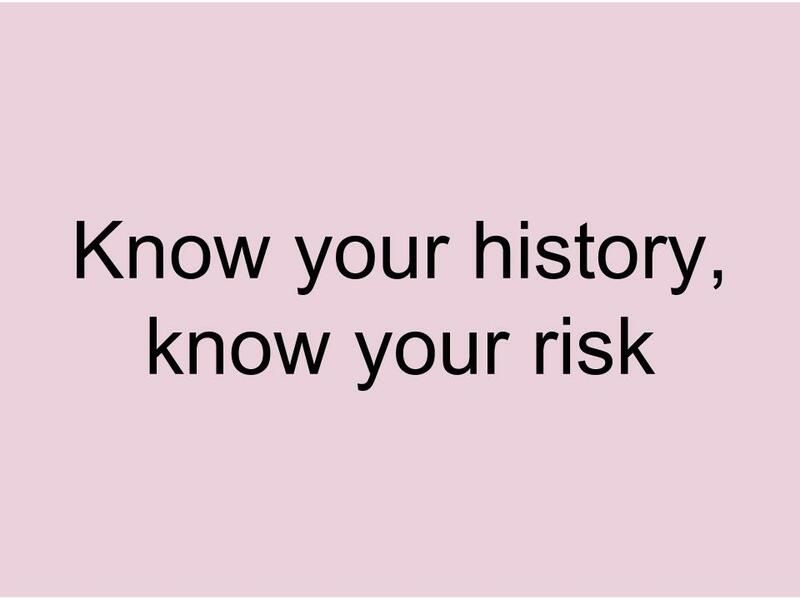 My doctor decided at my post-partum visit that with a history on both sides of my family, I should be tested for the BRCA1 and BRCA2 mutations. No one has ever mentioned this to me before. Oh, your mom was 56? You're good. Oh, it was your DAD'S sister? You're fine. But, you see, my aunt was under 40 at the time of her diagnosis, which sends up red flags now that people know more about the BRCA1 and BRCA2 mutations, and so I spit into a little testing tube, and my genetic material went off to a lab for testing. Three weeks later, I returned for the results, and I wasn't surprised to find that I do not have mutations, but what I do have is a much greater chance of developing breast cancer in my lifetime, 35.5%, in fact, while the general population has a risk of 13.2%. The risk, though, has nothing to with my mom's cancer, and everything to do with my aunt's, and that surprised me. What's funny is that, since my aunt's diagnosis and treatment were over 20 years ago, I never give them much thought. My mom finished radiation just about 2 years ago, and that cancer was much closer to me, much more immediate, but it doesn't increase my risk at all, since she was over 50 at the time of diagnosis. She fell into that 13.2%, case closed. What does this really mean for me? It means more frequent breast exams, mammograms, and MRIs. My doctor also wants me to consider some "chemo prevention drugs" that I will learn more after a consultation with a specialist. It means that I will need to talk to my daughter about our shared history. What else? I have to maintain a healthy body weight, keep exercising, and not drink too much. Check, check, check. Breastfeeding has upped my protection against breast cancer, and I'll keep breastfeeding as long as my daughter wants to nurse. Thank goodness for my babies! 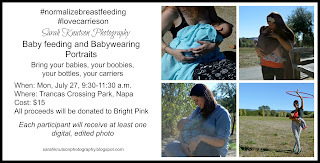 This also means, that as a photographer, I'll continue my breastfeeding photo sessions to help normalize breastfeeding, such a healthy way to feed our babies and keep our own breasts healthy, donating the funds to Bright Pink, an organization that supports breast and ovarian health. What does it mean for you? 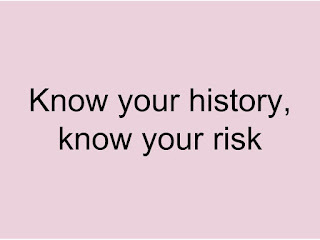 It means you need to know your history, know your risk, and talk to your doctors about both. We all need to be around a long time, running, writing, and hugging our babies.